[20:10] <~Dan> So let’s see… You say it’s system-neutral OSR. How does that work? Is it designed to work with any OSR system? [20:12] <+RPGPundit> Yes. The bulk of the book is dedicated to the setting. Of the 275 pages, most of it is setting-material, only about 20% is rules. In the setting section, any rules-stuff is kept intentionally generic enough to be suitable for any old-school system. This means it’s also easy to convert to 5e or to other non-D&D fantasy games. [20:12] <+maxmahem> so would you say this is more of a sourcebook or an adventure module? [20:12] <+RPGPundit> However, the book does also have the “Appendix P” rules which are like a whole new old-school mod you can super-impose on any OSR game to make it awesome. Also, a conversion appendix for Fantastic Heroes & Witchery. [20:13] <+RPGPundit> Sourcebook, max. It’s definitely a sourcebook. It’s similar in some ways to Pendragon’s “Great Pendragon Campaign”. 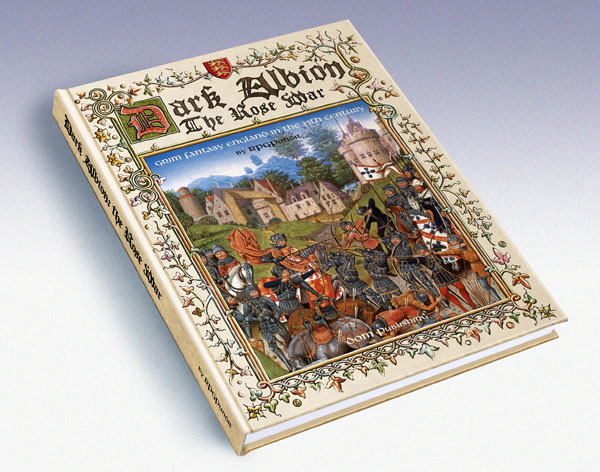 It provides a region-by-region overview of Albion, with many of its weirdnesses based on real medieval folk-tales. [20:14] <+RPGPundit> Then it has a chronology chapter which gives a point-form year-by-year coverage of the whole Rose War. And an NPC chapter detailing the major families that played in the war. [20:14] <~Dan> How “alternate” is this alternate history? [20:14] <+RPGPundit> Yes, Dark Albion does have a fairly Game of Thrones feel to it, if you want to run it that way. It’s based off the same event Martin based GoT off of. [20:15] <+Votan> The war of the roses has fantastic potential for meta-plot. But meta-plot can also be a burden (*cough* vampire *cough). How did you balance this in the book? Or do yu leave that up to each user? [20:15] <+RPGPundit> Dan: It’s alternate in that magic is real (and demon-summoning rules are based off of real medieval demon-summoning concepts like the Goetia), in that there are monsters, in that Clerics have miracles, and that Frog-men have taken over the frankish lands on the continent. [20:15] <+RPGPundit> But in terms of the people and events, it is very much true to history. [20:16] <+RPGPundit> It is not a world sort-of made to look a bit like 15th century england, like Westeros is. Its 15th-century England, with fantasy elements amped up. [20:17] <+RPGPundit> Votan: the “metaplot” is all post-loaded. That is to say, the book is set up so the default start of the campaign is 1454. After that, you have a chronology chapter that would let you go through 31 years of history if you wanted. Or you could just ignore that chapter. Or change events. [20:18] <+RPGPundit> You could choose to run a game not set in the courtly-intrigue at all. A game over on the Wall, or down in Dover getting caught up in the petty squabbles of local knightly families, or in the Welsh hills tombraiding. [20:19] <~Dan> Questions may restume! [20:20] <~Dan> Did I read that the setting replaces Christianity and Satanism with Law and Chaos, Pundit? [20:22] <+Votan> No, thank you. The chronology chapter sounds quite useful. [20:23] <+RPGPundit> In history it was never “Christianity and Satanism”. But I replaced Christianity (which includes belief in satan) with the Church of the Unconquered Sun, a Law-based religion which includes belief in Chaos. Except unlike belief in satan in our world, there’s demonstrable proof of the existence of chaos in the form of monsters, undead, elves, frogmen, etc..
[20:23] <+RPGPundit> votan: yeah, you can do what you want with it, use the parts that suit your campaign, or ignore them. [20:23] <+RPGPundit> Dan: note that the Unconquered Sun religion in Dark Albion looks ALMOST identical to Catholic christianity in our history. [20:24] <~Dan> Ah, that was my next question. [20:24] <+RPGPundit> The big difference is that there are clerics; who are a special militant order, gifted from childhood with miraculous power by the Unconquered Sun. They’re kind of like Knights Templar mixed with Jedi. [20:24] <~Dan> Because that’s a problem that I have with Victoriana: It goes the alternate history route but replaces Christianity with Law vs. Chaos. [20:25] <+RPGPundit> There’s still a Pontifex in Arcadia (i.e. Pope in Rome), there’s still saints (only its St. Apollonius now instead of St. Paul), and the priestly institutions, etc. [20:26] <~Dan> In your case, was the change more due to setting requirements as you envisioned them, or due to a desire to avoid offending reader sensibilities? [20:26] <~Dan> or something else? [20:27] <+RPGPundit> There were three reasons: first, it helps make the setting a bit more mythical and plays on the Law v. Chaos elements that are important in other pre-history details of the game. It puts Elves, the undead, Frogmen, etc. into context. [20:29] <+RPGPundit> (yes, all chaos, of different sorts; Law is One, but Chaos is Legion) Second, it emphasizes the ‘different but similar’ elements of the setting. Just like how I changed the names of most countries slightly but so they’re still recognizeable, etc. [20:29] <~Dan> Interesting touch, re: unified Law and diversified Chaos. [20:30] <+RPGPundit> Third; because there’s a lot of gamers out there who have issue with christianity and could not play a priest or Cleric as ‘good guys’, but would have no problem doing so if you scratch out “jesus” and put in “Unconquered Sun”. [20:30] <+RPGPundit> Plus I’m a Sun-worshiper myself, and Christianity was always just Sun Worship in Drag, so having the setting’s religion be Christianity-in-drag just seemed right. [20:31] <~Dan> I see. So how common is the supernatural in the setting, and what are its most obvious forms? [20:32] <~Dan> What are a commoner and an adventurer (or this setting’s equivalent) most likely to encounter? [20:32] <+RPGPundit> Its like this, from the perspective of the common peasant the supernatural is something they know is real but isn’t very common at all. The most likely ‘supernatural encounter’ they might have in their life is getting to see a cleric perform a healing at some religious festival, or if they’re unlucky running into a Zombie from an unconsecrated burial. [20:33] <+RPGPundit> They know other things exist, but if they’re somewhere in Middle-Albion they’re not likely to run into it. People in cities might also see Magisters, but most magisters don’t ever go around casting spells in public. In towns there’s the village wise-woman, but she mostly does herbalism. [20:34] <~Dan> Magisters being wizards in this context, or…? [20:34] <+RPGPundit> There’s also Cymri travelers who might come into your town, and one of them might tell your fortune or show some tricks that might be glamour or might be sleight-of-hand. [20:35] <+Teramis> Even though ppl in this culture don’t see a lot of magic or supernatural, do they tend to be superstitious? [20:36] <+RPGPundit> Teramis: certainly! I mean they all know that just across the pond there are Frog-men ruling over the poor human slaves; they know that if a wanderer dies in a wood and is not buried with the proper rites his corpse may rise to be a ghoul. They know the ancient barrow mound has dark magic from the time the elves ruled the world, and might have a barrow wight. [20:36] <+RPGPundit> mad as the Mad King! [20:37] <+RPGPundit> And then, if you go out into the periphery, into the border lands, into the oldest deepest woods, into the Welsh hills or the Pennine Mountains, or cross the Wall into Scots’ Land, that’s where you can see real monsters and magick. [20:37] <~Dan> Do the “real monsters” include flashy stuff like dragons? Or is it more low-key stuff? [20:38] <+RPGPundit> But magic is born of chaos; and as Albion slides into civil war and chaos increases in the land, magick will become more common, and some of the terrors of the night will start to come closer to home. [20:39] <+RPGPundit> There are some real monsters that are pretty flashy. However, Dragons have not been seen anywhere in Albion or the Continent for a long time, about two hundred years since the last credible sighting. It’s thought they might have all been hunted down, or gone far away. [20:39] <+RPGPundit> But once the Dragons ruled half the world (the Elves the other half). [20:39] <~Dan> What are the Elves like in this setting? Daoine Sidhe types? [20:40] <+RPGPundit> The Elves were the race that created man, or rather used magic to make men intelligent out of apes. They are immortal and made of magic and terrible. They ruled the world 10000 years ago, but became decadent. [20:41] <~Dan> A bit like Melniboneans, then? [20:42] <+RPGPundit> But there are places where this world and the world they went to touch, like at stone circles, or strange spots of nature, where sometimes you might see an Elf, if you’re very unlucky. [20:42] <+Votan> Is it more unlucky to see an elf or a dragon? Or are both bad? [20:42] <+RPGPundit> There are also still elven tombs found, mostly in Wales. [20:43] <+RPGPundit> Only the truly powerful or mad would dare to try to find them. [20:43] <+RPGPundit> Votan: hard to say. From the point of view of a typical Anglishman, both are terrible! [20:43] <+RPGPundit> Dragons are probably more powerful; there were always less of them. [20:44] <+Teramis> If you don’t go looking for elves, is it a safe bet that they won’t come looking for you? Or do they fall into the category of potentially ‘wandering monsters’? [20:44] <+RPGPundit> Of course, the Cyrmi Kings, thousands of years ago, made pacts with the dragons. Some say that the Cymri kings even magically interbred with them. [20:44] <+RPGPundit> But all the Cymri kings are long dead now, there’s only the Tudors, who have maybe one drop of true Cyrmic royal blood… but then.. their banner is the Dragon. [20:45] <+RPGPundit> Teramis: an elf should never be just a ‘wandering monster’. Mainly because in this setting they’re extraplanar creatures now. They could be found in places where there’s a lot of magick, though, or chaos. But never just in a random forest path or something like that. [20:46] <+Teramis> Good to know. [20:46] <~Dan> Are the Cymri essentially half-elves? Or maybe more akin to Tolkien’s Numenoreans? [20:47] <+RPGPundit> The closest thing to “orcs” are probably Goblins, which can be found in the deeper parts of the mountains and in Scots Land. [20:48] <+RPGPundit> They’ll sometimes raid villages or attack caravans. [20:48] <~Dan> Yeah, that’s the sort of thing I had in mind. [20:48] <~Dan> Monsters that are rivals to humanity rather than “simple” predators. [20:48] <+RPGPundit> Most Cyrmi are just Anglish gypsies, welsh descendants of those who did not convert to the Unconquered Sun or bend the knee to the Anglish kings. [20:49] <+RPGPundit> But Cyrmri PC should be among that small percentage that have some elf-blood, and so they have a ‘sixth sense’ and may have a gift for magick. [20:49] <~Dan> If you don’t mind, I’d like to rewind a bit to something you said about Chaos that intrigues me. [20:50] <~Dan> Did I understand correctly that the chaos created by the War of the Roses is strengthening capital-C Chaos, and hence the supernatural? [20:51] <+RPGPundit> Not so much ‘strengthening’ as it is that chaos is opportunistic. With the war, you see things like the patrolling of roads, safe travel, and the guarding of the Wall all losing strength, while banditry, bloodshed, loss of faith, are all on the rise. [20:52] <+RPGPundit> So it’s naturally time when monsters will start to flourish more in the forests, where goblins will come out raiding from the mountain passes, when the unsanctified dead will rise and terrorize the living, and where heresies and strange cults will gain ground. [20:54] <+RPGPundit> Yes, though of course there are powerful servants of chaos who would also try to damage or destroy the worship of Law. [20:54] <+RPGPundit> Some Yorkists even say Queen Margaret is one of them! [20:54] <~Dan> On a related note, I’m assuming that clerical miracles do not count as “magic” in this setting, but are manifestations of Law? [20:55] <~Dan> Or are there Chaos-worshipping clerics? [20:55] <+RPGPundit> That’s right. ALL Clerics are Lawful, and no non-lawful religion gets Clerical magick. So aside from the Unconquered Sun, you have (in the Turk lands) the followers of the Crescent Moon, which is actually another form of the same god of Law. [20:55] <+RPGPundit> So their sufis have clerical magic. [20:57] <~Dan> And I assume that nature spirits and Demons are very different sorts of Chaos? [20:58] <+RPGPundit> Well, nature spirits are barely touched on in the book. There is no “neutral religion” out there, at least not anywhere near Albion. The Scots Men worship nature spirits, as did the Northmen (though most of these now follow the Unconquered Sun). [20:59] <+RPGPundit> But “demons” is the term for those extraplanar beings that are part of the legions of chaos. [20:59] <~Dan> But would it be correct to say that both Elves and Dragons (if they still exist) are manifestations of Chaos as well, albeit different sorts? [21:00] <+RPGPundit> As far as everyone knows, yes. Elves and dragons are chaotic beings. There are some people who think differently, that perhaps there were some Law-serving dragons, but that’s usually seen as heresy. [21:01] <+RPGPundit> The elves worshiped Chaos “gods” (demons). For most of their history, the gods of magick, but near the end of their empire a powerful cult to the death-gods sprang up instead. [21:02] <~Dan> I ask in part because I think you’ve created an interesting dynamic here, in which the unified followers of Law would tend to see Chaos as an equally-monolithic force for evil rather than a multifacted thing; hence, Faeries are just as bad as Demons. All Chaos. [21:03] <+RPGPundit> Yes, that would be a very common view among the average Angleman. Only magisters, clerics, and some other very well-educated types might create more distinctions than that. [21:03] <+RPGPundit> or of course some deluded cultists. [21:04] <~Dan> So what are some of the distinct traits of magic (and clerical miracles) in this setting? Is it still “fireballs and lightning bolts”, or is it more restrained? [21:04] <~Dan> And can you say a bit more about Demonic powers? [21:06] <+RPGPundit> You take out a lot of the flashier more damage-inducing spells. No fireball, no lightining bolt. [21:06] <+RPGPundit> You also remove “raise dead”. [21:06] <+RPGPundit> You get rid of a lot of the crossover between magic-user and cleric spells. [21:06] <+RPGPundit> Second, magic items are way less plentiful. They’re very rare, for the most part, and intensely treasured. [21:07] <~Dan> More like artifacts? [21:07] <+RPGPundit> The default ‘magic weapon’ you are most likely to find first, and even then its not common at all, is the “Sword +0”, that is, a sword that can damage supernatural creatures but gives no special bonuses besides. [21:08] <+RPGPundit> Yes. Because Magisters and Clerics in the present can only really make scrolls or potions. Other magic items are almost impossible to make now, so that they’re only found in ancient sites or passed on as heirlooms. [21:09] <+RPGPundit> Human magic has become less and less powerful over time as knowledge was lost. The Cymri kings were very powerful magicians, but after their line diluted they lost that. The Arcadian Empire (the Romans) were pretty good magic users, but that too faded. [21:09] <+RPGPundit> In general the level-spread is low in Albion. A 9th level character is a very powerful hero. [21:09] <~Dan> Is there an Atlantis analog? [21:09] <+RPGPundit> The highest level dudes in all of the island are probably no more than 9th-12th level or so. [21:10] <+RPGPundit> No, not really any atlantis analog.I mean, there probably was one, down in the Mediterranean, but its not very important to Albion. [21:10] <+RPGPundit> The ancient Elven kingdom in Albion was based in what is at present Wales. [21:11] <+RPGPundit> Lost magic can be obtained, in theory (and as the GM allows it) from ancient sites, and also could be in theory taught by Demons. [21:11] <+RPGPundit> Which brings us to demonology: the demon-summoning rules are based on medieval grimoires. [21:12] <+RPGPundit> They’re not tied to the spell system. So in theory a 1st level magister or a spell-casting Cymri or peasant folk-magician could summon a demon. [21:13] <+RPGPundit> To summon a demon you have to know the standard ritual format (which its assumed any 1st-level arcane-type spellcaster would know), but you also have to have the correct sigil and name. [21:14] <+RPGPundit> blaster: it adds an element of danger to low-level play to be sure, but its not that different, in that sense, to how LotFP does it with the “summoning” spell. [21:15] <+RPGPundit> If you obtain a sigil and name, you can try to summon the demon. Then you’d need to do a check to see if it will come. [21:15] <+RPGPundit> Demons have a hierarchy by rank. So a Demon Knight is easier to summon than a Demon Duke. [21:16] <~Dan> Ah, so there’s no “Summon Demon” spell — you just learn how to summon a specific Demon? [21:17] <+RPGPundit> yes. But you have to find the sigil and name; usually in a grimoire, or being taught by someone else who knows it. [21:18] <+RPGPundit> Once you’ve summoned it, you have to engage in a test of wills. If you succeed, you can oblige it to perform a task for you (just what kind of task depends on how well you succeeded, and just what the demon can do for the task depends on the demon’s qualities). [21:18] <+RPGPundit> If you fail, you can try to banish the demon or you can try to dominate it again; so the contest of wills can go on for some time, but it gets harder as you go. [21:19] <+RPGPundit> You might also fail catastrophically, in which case you could end up possessed. [21:19] <+RPGPundit> Alternately, instead of dominating it you could enter into a pact with the demon. But this is in essence selling yourself to Chaos. [21:20] <~Dan> By the way, does Law have Angelic servitors? [21:20] <+RPGPundit> Dan: It is known that the Unconquered Sun has angels, but they cannot be summoned by mortals. [21:20] <+RPGPundit> At least, not by means anyone knows, because John Dee wasn’t around yet. [21:21] <~Dan> Ah, was Dee the first to come up with Enochian magic? [21:22] <+RPGPundit> Technically, no. But he did the best job of it. Anyways, there’s no equivalent of ‘angelic summoning magic’ in the book. [21:23] <~Dan> Now, with all the talk of Law and Chaos, do you keep alignments, and if so, is it of the Law-Neutral-Chaos variety, no Good/Evil? [21:23] <+RPGPundit> Demons can grant knowledge (including spell knowledge), send servants (lesser demons), or use special powers. The “powers” in question are directly taken from the medieval Grimoires. [21:24] <+RPGPundit> Dan: since the book is system-neutral, in theory a GM could use the alignment system he prefers. But the game assumes that the important axis is Law-neutral-chaos. You could also have the Evil/neutral/good axis there, but it wouldn’t be as important. I provide some advice on this in the book. [21:26] <+RPGPundit> Comments? Praise for how much you like the book, if you have it already? [21:27] <~Dan> So are the creatures in the book totally stat-free? Or is there a minimum of info you provide to make the usable? [21:27] <+Votan> PCs as nobles, how does that work out in actual play-testing? [21:28] <+RPGPundit> Which have a kind of generation process, so they don’t have fixed stat-blocks as such. [21:29] <+RPGPundit> Votan: my “play test” of Dark Albion is the two Albion campaigns, one which ran for 2 years, the other is still running now after more than 4 years. In it, we’ve had several characters playing nobles, and it’s been pretty good. [21:30] <~Dan> How do you determine if a new PC is a noble? [21:30] <+RPGPundit> The assumption is that noble PCs will not usually be the actual title-holder of their family (at least not at first). But a GM who wanted to could also do a whole “noble” campaign. There are Noble House Management rules in the game. [21:30] <+RPGPundit> There’s a chapter on character creation, and one of the steps in creating a character is to roll social class. [21:31] <+RPGPundit> Social class is super-important to the setting, unlike most D&D-type settings. Your class matters a LOT. [21:31] <~Dan> I’d think so, yes. [21:32] <~Dan> Do you see this as a one-off supplement, or as the start of a game line? [21:33] <+RPGPundit> Well, as you may know, I’ve mostly been a designer of one-off books. I don’t tend to do supplements. However, in this case I know for a fact that Dominique Crouzet is doing at least one and probably two or three adventures for Dark Albion, that I will be helping out on. [21:34] <~Dan> And will they be system-neutral as well? [21:34] <+RPGPundit> There’s also other material to cover here. For example, I provide good material on Albion, Scots’ Land and Wales (and decent coverage of The Continent) in the book, but hardly anything about Eire Land. [21:34] <+RPGPundit> There’s a whole book to be written there, in theory; maybe by me, maybe by someone else. [21:34] <+RPGPundit> I would assume that anything done for Dark Albion would be OSR system-neutral. [21:35] <+RPGPundit> There could also be regional adventure/sourcebooks for specific parts of Albion. Or for areas of the Continent. [21:35] <~Dan> What are your thoughts on the demand for system-neutral RPG products in general? [21:35] <+RPGPundit> Dan: well, they make sense in the OSR. Because OSR games are all so similar that in essence almost any non-corebook done by the OSR is effectively compatible. [21:36] <+RPGPundit> So it’s easy to make setting books, sourcebooks and adventures which could really be used for any OSR game. [21:36] <+RPGPundit> I think that a totally generic systemless book might be less good sense. [21:37] <~Dan> Yeah, I agree. [21:38] <~Dan> To what degree do you see Dark Albion adventures resembling a “typical” D&D adventure? [21:38] <~Dan> Or differing from one, for that matter. [21:38] <+ArdentPurple> RPGPundit: What is your personal OSR game of choice for running Dark Albion? [21:39] <+RPGPundit> It depends a little on the type of campaign you want to run. A GM could in theory take Albion and run exactly the same stuff. He could also add fireballs and Halflings and such, but then it would really just be like Greyhawk or something. [21:39] <+RPGPundit> I can tell you that in my Albion campaign, there were three types of adventures run, for the most part: 1) Intrigue type adventures featuring players and events in the Rose War. So “Game of Thrones” stuff. [21:41] <+RPGPundit> 2) Warfare adventures during the Rose War. Where PCs were either soldiers, commanders, scouts, saboteurs, raiders, etc. and fought or saw major battles. [21:42] <+RPGPundit> 3) More conventional “wilderland exploration” adventures. These were the most like typical D&D play, but the locales were all in an Albion context: old Cymri Barrows, Elven Tombs, lost Arcadian temples in the forests, Arcadian catacombs, going north of the Wall to fight Scots Men or Giants, etc. [21:43] <+RPGPundit> Or when they got to higher levels, going to Wallachia to kill of Dracula (when he went from being the great hero of the Unconquered Sun to becoming a Vampire Prince). [21:44] <+RPGPundit> Right now my Albion players have spent the last several months of real time on a long quest to recover the pieces of the Lance of Mithras. [21:45] <+RPGPundit> As of last adventure, they’ve actually gotten to the lands of Khem and are exploring a Pyramid with a couple of Sufis, to defeat an ancient evil so they can convince the Turk Sultan to give them the part of the lance in his possession. [21:45] <+RPGPundit> But before that they were mired in Welsh politics, trying to help their ally William Herbert, who is the Yorkist lord of Wales, and hated by the local peasantry who still support the Tudors. [21:46] <~Dan> I’m not generally an OSR guy. Do most of them lack skill systems? [21:47] <+RPGPundit> Dan: a lot of OSR games lack skill systems, a lot of them have skill systems. [21:47] <~Dan> Ah, okay. I ask because I’d think that intrigue type games would seem difficult without a skill system. [21:47] <~Dan> Unless you just freewheeled it, I suppose. [21:48] <+RPGPundit> But almost all OSR games have some kind of “check” system, something you can roll to do stuff. So with Dark Albion I handled this by making it clear what you’d need to be checking for in different circumstances, and then the reader can apply that to a relevant skill or just an attribute check or a number on a d6 roll or whatever they use. [21:50] <~Dan> What games/settings would you consider to be Dark Albion’s direct competitors? [21:52] <+RPGPundit> ..and mine is a more super-traditionalist style. [21:53] <+RPGPundit> You could say in terms of similarities, that Albion is a bit like WFRP, or Pendragon, or obviously the Game of Thrones RPG. But it’s really not quite like any of the above. [21:53] <+RPGPundit> It’s closer to real-life european history (and a bit less ‘heavy metal’) than WFRP. [21:54] <~Dan> Yeah, I can see that. [21:54] <+RPGPundit> It’s less fairy-tale style than Pendragon. [21:55] <+RPGPundit> And its not a fantasy-world like GoT’s westeros ultimately is. But Dark Albion can definitely let you do that “GRR Martin, by way of Shakespeare” vibe. [21:55] <+maxmahem> do you think it could be used with Pendragon? [21:55] <+RPGPundit> Max: I’m not sure in what sense you mean. You could use the pendragon rules and run it in the Dark Albion setting, if that’s what you mean. I would definitely think so. [21:55] <+maxmahem> Yeah thats what I mean. [21:56] <+RPGPundit> Yes, then. Totally. Though if you’re talking the last couple of Pendragon editions, it would mean you’d be doing a very specific kind of Albion game: where you’d be Knights, I suppose. And they wouldn’t be the chivalrous knights of Mallory. [21:57] <+RPGPundit> Mallory shows up in Dark Albion, by the way. He was a knight who actually fought in the war. La Morte D’Artur is in some ways a commentary on the war. [21:58] <~Dan> So in what remains in “regular time”, is there anything we haven’t covered that you’d like to bring up? [21:58] <+RPGPundit> He was a knight in the service of Warwick the Kingmaker, who was pretty much the opposite of the chivalrous men of honor he conveyed in his tale. [21:59] <+RPGPundit> Hmm, I don’t know. I’m open to any other questions. I think anyone who wants a really awesome kind of historical-fantasy setting should definitely pick up Dark Albion. If you like Shakespeare’s historical plays, or if you like Game of Thrones, you’ll probably like Albion. [22:01] <~Dan> And to field questions. [22:01] <+RPGPundit> Will do! At least for a while more. [22:01] <~Dan> Yes, thank you very much for coming by, Pundit!